This past weekend I had the opportunity to attend Spark Sessions: Canada’s first fashion and beauty blogger conference. In summary, the Toronto conference encompassed 2 full days of learning, networking with PR professionals, and mingling with (over 250) fellow fashion and beauty bloggers. I can’t say enough good things about this conference, and as promised, here is a review of my experience! Over the 2 day conference, there were approximately 7 sessions covering various blogging-related topics, as well as keynote speakers. You can check out the agenda, linked in my previous post. a) Vanessa Craft (Beauty Director at Elle Canada) was one of the keynote speakers on Day 1. In her speech, she talked about the importance of being true to yourself, your vision, and your voice. I felt compelled to pass this along, as I think it’s relevant whether you’re a blogger or not. All too often we catch ourselves saying making excuses for who we are: I’m “just” an intern, I’m “just” a coordinator, I’m “just” the new girl. Vanessa’s thoughts on this really resonated with me: “The only way to find your voice is by using it”. b) Lena Almeida (Lisentolena.com) ran a session on “The Business of Blogging”. She talked about her journey as a blogger, and how she turned her hobby into a full-time business. Lena started her blog, resigned from her full-time job in the corporate world, and was determined to make blogging her career within 5 years. She did (and in less than 5 I might add!). Lena’s story taught me the importance of trusting your heart, taking leaps of faith, but also, the need to work hard, and recognize your potential. c) Cheryl Hickey (Host of Entertainment Tonight Canada) was the closing keynote speaker at Spark Sessions on Day 2. I think we often assume that those in the spotlight have had their careers handed to them; that they were offered success on a silver platter. Cheryl’s story is both real and inspiring. She talked about all the challenges she’s faced, sacrifices she’s made, and chances she’s had to take to get where she is today. She is incredibly humble and down-to-earth, and even took time after her speech to meet and greet with attendees. She also spoke about her new natural skincare line, “Ours by Cheryl Hickey”, which you can check out here. The conference had a wide variety of sponsors, ranging from clothing companies, to makeup and skincare brands, to a bakery that made the most delicious (and beautiful) sweets. Below are just some of the many awesome sponsors who’s kindness and generosity helped make the conference that much more amazing! 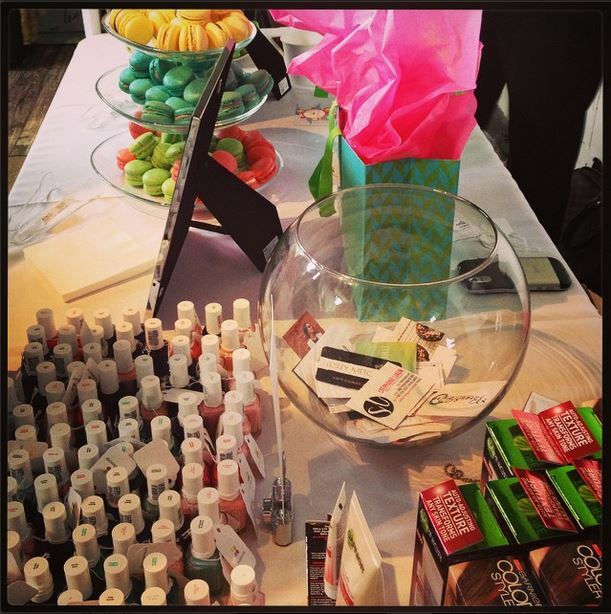 CrowdSocial was onsite offering free Essie polishes, temporary hair dye (I chose pink! ), and the best macarons I’ve ever tasted (no exaggeration). Nicole by OPI was displaying some of their gorgeous polishes (all of which I want!). Aside from fun bottles of branded water, Bench Canada brought with them some items from their Spring 2015 collection. While they’ve taken a slight detour from the style you might be familiar with, the new pieces are modern, chic, and wearable: you’ll want them all! Vitabath offered conference-goers the opportunity to take a fun “sudsy selfie”; here’s mine below! Vitamin Water provided water in every flavour and colour imaginable, which complimented meals and snacks perfectly (I unfortunately didn’t get pictures of the meals, but both days offered delicious spreads). Keurig Canada was also onsite, ensuring attendees had their morning and afternoon dose of caffeine. Check out the rainbow of Vitamin Water below! Benefit Cosmetics was offering attendees an “Insta Eye Lift” using some of their highly-coveted (and super fun) products. Funny enough, I was already wearing one of the products they were sampling that day (I blogged about it previously here). I’d be lying if I didn’t admit that this was one (of the many) highlights of the conference for me. I mean, how amazing is this swag bag?! Packed full with products from the very generous sponsors, I could not wait to get home and try out these awesome goodies. Some additional sponsors, not already mentioned above, include: Nivea, Pretty Tea, Happy Plugs, Biore, John Frieda, Clarisonic, Jergens, Clear Scalp & Hair, and more! I am so grateful to have attended Spark Sessions this year, and am already looking forward to seeing what 2015’s conference has in store. Whether you’re just starting out, or are already an established beauty and fashion blogger, Spark Sessions has a lot to offer. Not only did I learn an entire notebook full of new things, I also built friendships that I look forward to growing in the months and years to come. It’s happened to the best of us: we hop on the “hype” train when a new product comes out, only to discover it really wasn’t worth the trip in the first place. Bummer. For drugstore products, you usually have to bite the bullet and pass them on to a friend (or a garbage can), and, so long as you’ve purchased those higher-priced items at Sephora, you’re in the good hands of a solid customer return policy. The following are items I regret buying, as well as those I recommend you spend your hard-earned dollars on instead. When purchasing this product, I’d already become a big fan of First Aid Beauty’s “Facial Radiance Polish” and “Daily Face Cream“, so I was disappointed to discover that this eye cream did nothing for me (especially at such a high price point). It didn’t moisturize or calm my skin, (in fact, I actually had a reaction to it). In it’s place, I’d recommend Jurlique’s “Herbal Recovery Eye Cream”, that gently hydrates and smells amazing. They’re Real Mascara is my an all-time favourite of mine (I posted about it previously here), and I was thrilled to discover that Benefit had come up with a solution to the sometimes-hard-to-remove holy-grail mascara. I wanted so badly to love this product as much as I love the mascara, but sadly, all it did was burn and sting my eyes, and barely removed the mascara at all. There are two products I’d recommend in this remover’s place: 1. Clinique’s “Wash-Away Gel Cleanser”, and 2. The Body Shop’s “Camomile Gentle Eye Makeup Remover”. Both of these remove makeup like a pro, and have been longtime favourites of mine. To be fair, the idea behind this blush is adorable: “Infused with our Happy Boost Blend, featuring Happy Skin and Euphoryl, natural plant extracts which have been shown to promote a feeling of happiness by mimicking the effect of Endorphins and helping protect the skin from environmental stress. The sweet scent of Violet provides a feeling of joy each time you apply!” (Well.ca). The packaging is cute, the colours in the mix are pretty, and the payoff is good, I just can’t say this blush made me any “happier” than others I own. For drugstore makeup, it’s also on the higher-priced side, and I think there are others you can buy that will make you just as…happy. For example, the Hard Candy boxed blushes I talked about here for a fraction of the price. It’s no secret that Essie is a front-runner in the nail polish industry, so I assumed their nail stickers would be equally as impressive. Wrong. The application was fast and easy, but within less than 24 hours of wear there were chips on almost all of my nails. As I have many times before, I highly recommend purchasing the Sally Hansen Salon Effects Real Nail Polish Strips. These are the only strips I’ve found that live up to the “long-wear” claims (mine really do last upwards of 10 days). What products do you regret buying? Let me know in the comments below!